Many clinicians continue to view diabetes mellitus as essentially an endocrine disease associated with hyperglycemia. Although the risk of developing specific complications of diabetes such as retinopathy, nephropathy and neuropathy is clearly associated with the degree (and duration) of hyperglycemia, the relationship between diabetes and macrovascular disease remains poorly understood (1,2). However, among patients with type 2 diabetes mellitus, the most common cause of death is cardiovascular disease (3). Improved glycemic control reduces microvascular complications in both types 1 and 2 diabetes, but requires many years of intensive treatment (4,5). 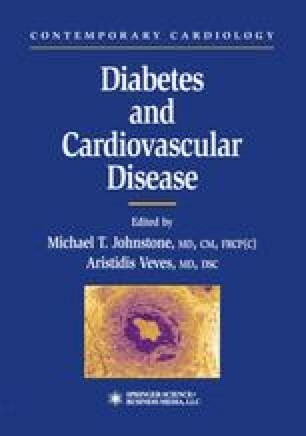 However, The UK Prospective Diabetes Study (UKPDS) demonstrated unequivocally that improved glycemic control alone is insufficient to reduce the incidence of diabetic macrovascular complications (stroke and myocardial infarction) in patients with type 2 diabetes (5). Conversely, more aggressive lowering of blood pressure reduces the incidence of stroke and overall mortality amongst patients with type 2 diabetes (6). Perhaps, unsurprisingly, blood pressure lowering is also more effective in reducing the incidence of diabetic retinopathy than aggressive glycemic control (6). Moreover, cholesterol reduction also reduces macrovascular disease and mortality in diabetic patients (7). Taken together, these findings reinforce the concept of diabetes as a vascular disease.